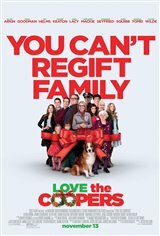 Charlotte Cooper (Diane Keaton), who's married to Sam Cooper (John Goodman), wants the perfect Christmas. Each year, their children come home for Christmas Eve. Their daughter Eleanor (Olivia Wilde) feels that each year she comes home without a boyfriend, her mother expresses disappointment so this year, she's determined to bring someone, even if he's a complete stranger. She finds a military man, but when she introduces him to her parents, it turns out he has quite a sense of humor. Meanwhile, their son Hank (Ed Helms), a single father, is raising his daughter Madison alone. Madison has picked up a colorful phrase that's hard to ignore and causes embarrassment when she utters it in public. Their other daughter, Emma (Marisa Tomei), is caught shoplifting jewelry. In the midst of all the festivities, everything comes apart.